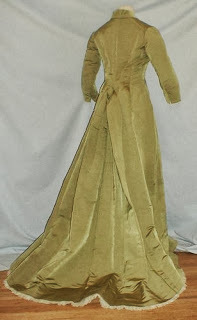 An elegant 1880’s green silk bustle tunic styled bodice with a long train. 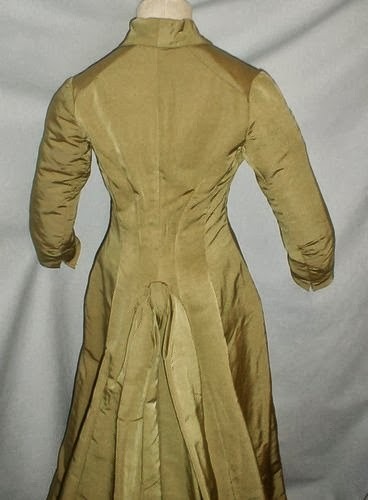 The bodice has recently been de-accessioned from a museum collection. The cataloging tag is stitched inside the bodice. 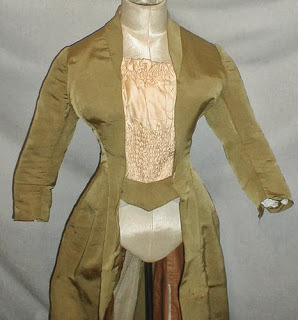 The bodice has a front insert made of ivory silk with an attached green silk belt. The back extends into a long train. The bodice is fully lined with cotton and buckram. The lining has a front hook and eye closure and the ivory silk fabric hooks to the side. 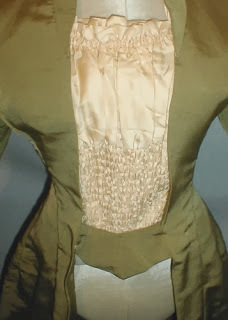 The bodice is in very good and sturdy condition. There is no discoloration just shadows created by the camera flash. There are no splits or holes. There is light underarm discoloration under one arm and a few scattered small pea size age spots and one dime size. There are missing hooks and eyes on the front silk insert. 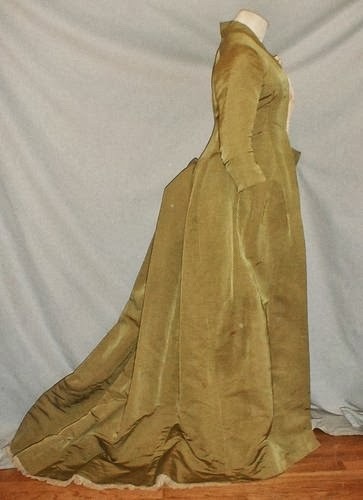 Bust 34 Waist 28 Front skirt length 40 Back length 51. The sleeves still have that odd 1860's thing going on and the open neckline tend to indicate an earlier date. 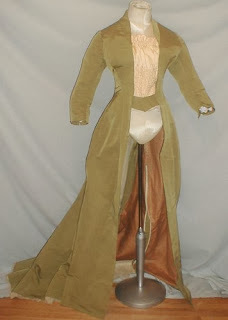 I'd love to see this paired with one of those ruched up and gathered cream silk bustle skirts.